Early in the morning, on 9 Dec 2018 the adventure began. 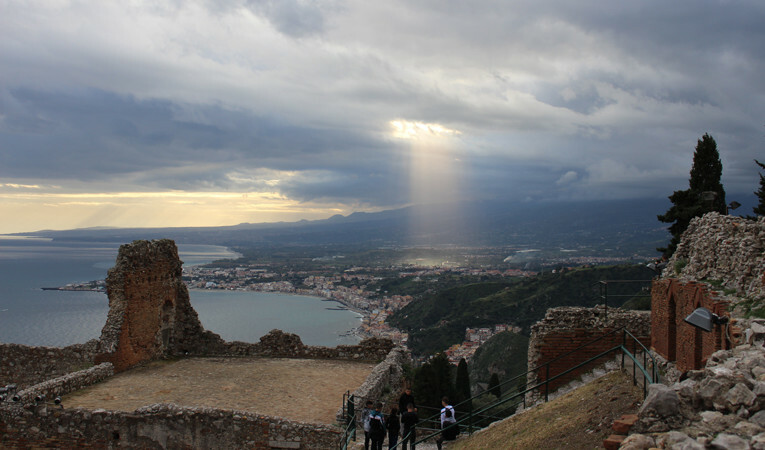 9 students and 3 teachers of our school flew to Sicily (Catania). All of us were excited what it would be like there. We wondered how our host families and the other students from Portugal and Malta would be. When we reached the airport in Catania at about 10:00 am, we met our host families for the first time. Each of our group of 9 students spent the morning individually with their host families. 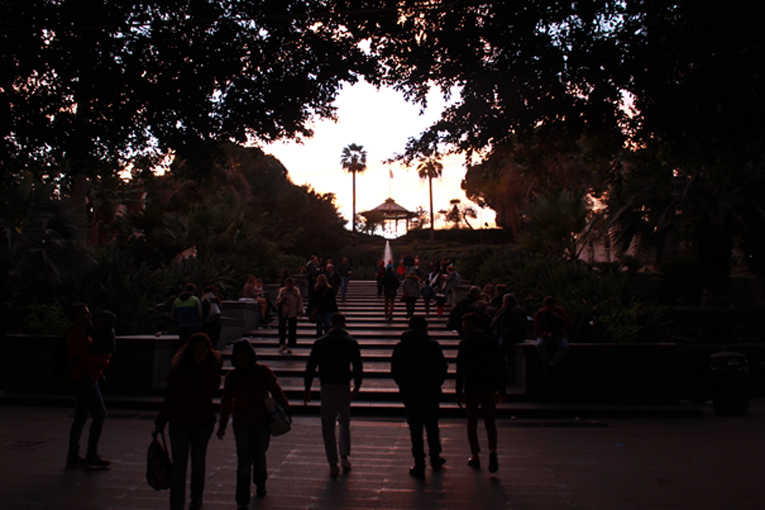 In the late afternoon, we all met to explore the city of Catania together. We tried typical Italian food for the first time, and the first evening ended in a relaxed atmosphere in the restaurant. On our second day we went to school at 9:00 am, we were officially welcomed in Catania. We did some warm-up activities to get to know each other and had a coffee break at school. Afterwards the participating groups of students gave their presentations on the different topics. After the presentations we had lunch at school, we ate typical Italian food like Arancini (rice balls filled with ham, cheese and tomato sauce). At 14:00 we voted for the best logos from for our project. The logo designed by the Portuguese came out best. Our German logo was second. 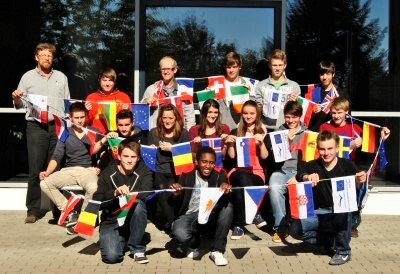 At 15:00 we did a workshop on the Europass together with our group mates. Afterwards, when school finished, we went home to our host families and later we all met in the centre of Catania and had dinner. On Tuesday we visited the “CioKarrua Company” in Modica, engaged in the manufacture of chocolate. During the interesting guided tour of the company, we were told its history and saw the manufacturing process of its products. The students had the opportunity to interview the young entrepreneur focusing the attention on the marketing strategies of his successful business. Later we went to Ortigia, a small island also known as Old City, which is the ancient centre of the city of Syracuse and contains many historical landmarks. We had lunch there and enjoyed the magical sights and attractions of the town. We spent the evening in Catania centre with the other international project participants. On Wednesday morning we all went to the school with our Italian hosts. 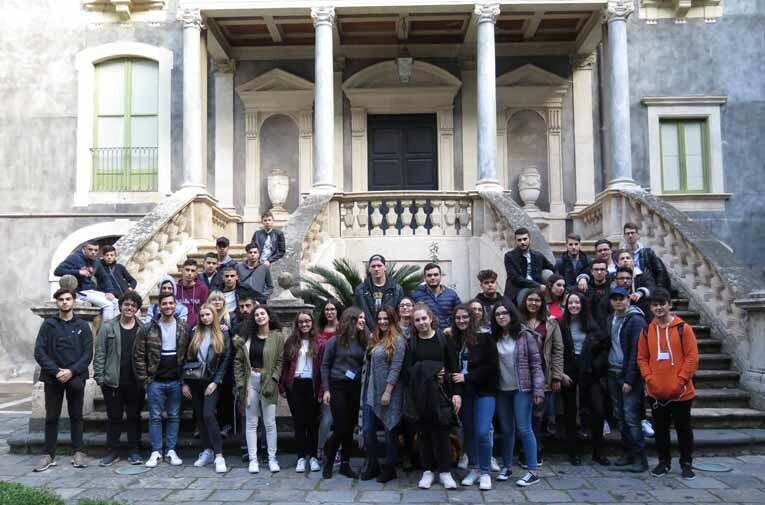 We all were already excited to learn more about the Erasmus project and the city of Catania. At nine o‘clock we all met at school. At school we listened to a presentation about the guidelines to write a cover letter for the Europass, presented by Ms Patrizia Riccobene. After her explanation we had to write a cover letter in groups. After the exercise we had a coffee break. We all had Italian coffee and tea with some biscuits and cake. When everybody was finished with eating we travelled to Taormina in a private bus. The bus ride took about 2 hours. There we visited the Greek Theatre. 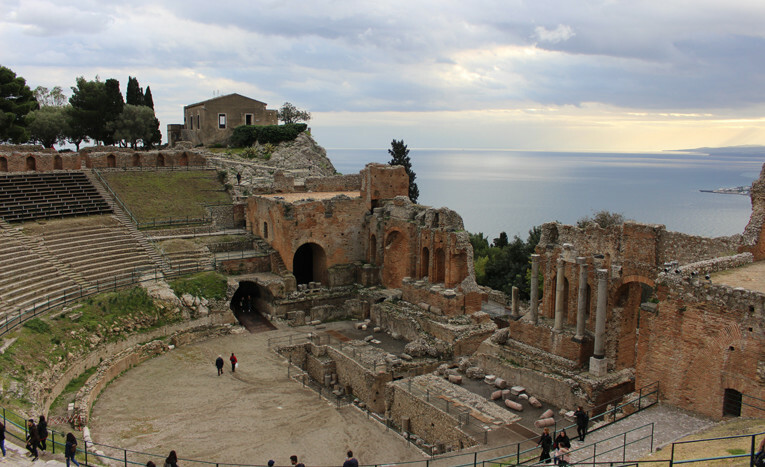 We all discovered that not only the Greek Theatre but also the city itself was beautiful. After taking pictures of ourselves and the city we got 2 hours of free time for activities like shopping. At 5 pm we met again and got ready for the departure to Catania. Once again this took 2 hours. When we arrived everybody went home to change clothes and refresh for a dinner at a restaurant. Some of us tried horse meat at the restaurant and some just stayed with their beloved chicken. 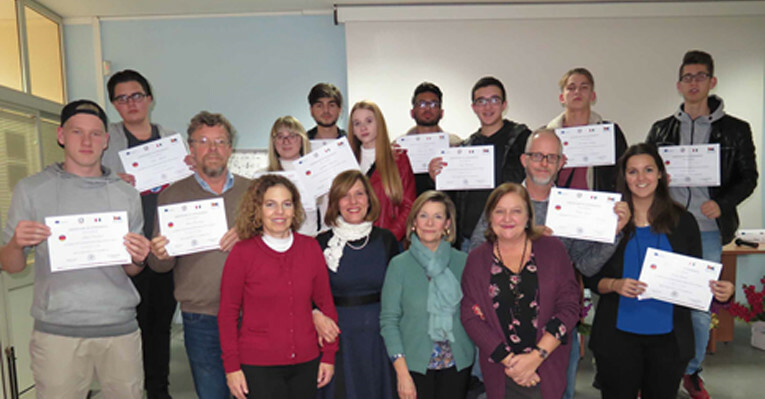 On Thursday 13th December, the whole project group met at the underground station and took a metro train to visit the University of Economics in Corso Italia. After the lesson held by the Professor Ms Nicotra, we had a training session on how to start a business in Italy. They taught us a way to open a window to the future with a business game directed by Ms Tutino. 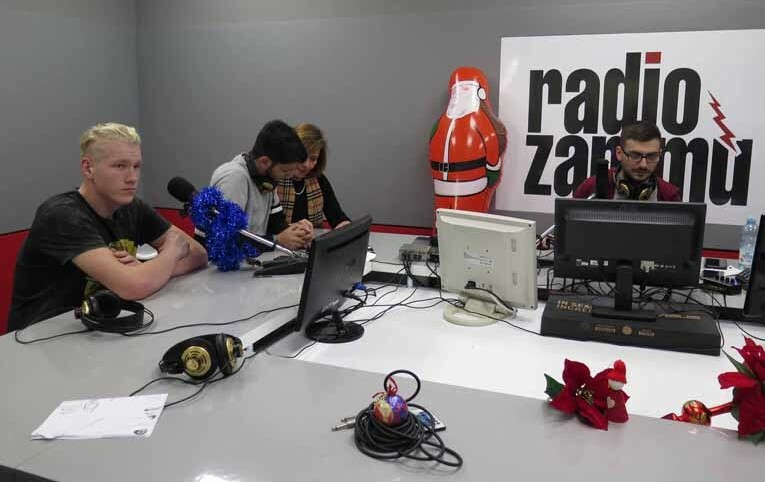 At 1:30 p.m. we were welcomed to the radio station: „Zammù Studio“ where a few of us gave an interview on the project and how we liked our stay in Catania. Last but not least we had a lunch at the restaurant „Catania Manganelli“ and a guided tour of the historic centre of Catania. We were led to an interesting elephant in the middle of the city centre and we got told that the elephant is the symbol of Catania. Afterwards we enjoyed our free evening. On Friday 14th December we did a couple of warm–up activities and we had a lot of group work exercises. We also had a presentation by Ms La Marca on job interviews and how to face them. She told us a lot about the most important things we need to know or have for a job interview and she also told us a couple of possible mistakes which we could avoid in a job interview. After her presentation we got our Erasmus+ certificates of participation. For the rest of the day we had a lot of free time and we used the time to go to the city and learn more about the Italian culture and do some shopping. In the evening we had an amazing dinner with all of the programme members and the teachers. The majority of us would say that it was the best day of the week. COMENIUS ist der schulbezogene Teil des EU-Programms für lebenslanges Lernen, das mit einem Budget von knapp sieben Milliarden Euro ausgestattet ist. Bis zum Ende der Laufzeit des Programms sollen europaweit mindestens 3 Millionen Schüler an gemeinsamen Bildungsaktivitäten innerhalb von COMENIUS-Schulpartnerschaften teilgenommen haben. Die Partner arbeiten jeweils für die Dauer von zwei Jahren zu einem selbst gewählten Thema von gemeinsamem Interesse zusammen und bekommen dafür Fördermittel von der EU. C.A.R.S. (Cars are really super) rückt das Auto, seine Geschichte, seine technische Entwicklung sowie seinen Einfluss auf Kunst und Kultur in den Mittelpunkt. Auch die Kehrseite der automobilen Gesellschaft (Staus, Unfälle, Umweltverschmutzung, Verbrauch natürlicher Ressourcen) wird - auch unter der Perspektive möglicher Auswege - beleuchtet. Im Projekt GREEN geht es im Wesentlichen um die Erhaltung von Natur und Umwelt, den schonenden und verantwortungsvollen Umgang mit natürlichen Ressourcen. Menschen für diese Themen zu sensibilisieren und sie von der Notwendigkeit einer Verhaltensänderung zu überzeugen, sind hier vordringliche Ziele. Recherche, Dokumentation und Präsentation der Ergebnisse stärken die Medienkompetenz und Kreativität der Lernenden. Der Gebrauch der Projektsprache Englisch verbessert die Sprachkompetenz und ermöglicht interkulturelles Lernen. Internationale Begegnungen mit anderen jungen Europäern (unsere Projektpartner kommen aus Frankreich, Italien, den Niederlanden, Rumänien, Spanien, der Türkei, Ungarn) tragen zur Verständigung bei und befördern das Zusammenwachsen Europas.